-- You're ready to bake and suddenly you can't find one of the ingredients in your pantry that is specified in the recipe. Don't give up - use this short guide to locate a substitution and you'll avoid having to run to the market. If you're using a recipe written with foreign measurements, you'll be able to convert them in minutes. 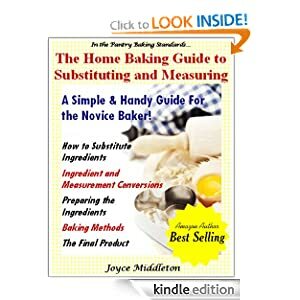 Best-Selling Author Joyce Middleton brings you this handy guide on converting standard measurements such as tablespoons to ounces, cups to pints, ounces to a pound, cups to liters and what ingredient you can safely substitute in baking.